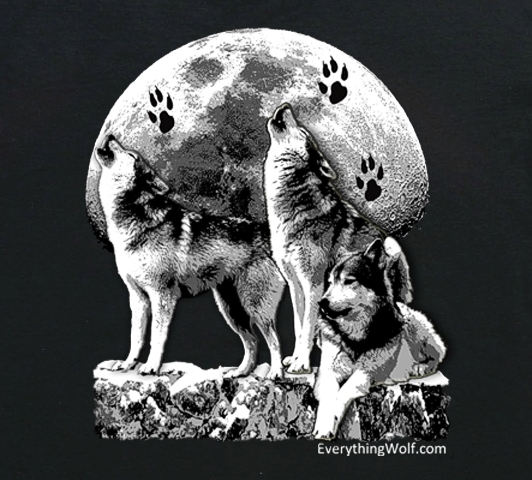 Owning the Moon Wolf T Shirt was designed and printed right here at Wolf Howl Animal Preserve. This Wolf T shirt features our Wolves. Woha and Chito are howling under a winter moon while Waya, our lone Wolf chills beside them. Wolves howl more during the winter especially during their breeding season. When the moon is bright it allows them to see better which promotes more howling as well. The Wolves own a moonlit night. If you look closely you will see their paw prints on the moon. This Wolf t shirt is made of 6oz weight 100% cotton preshrunk jersey knit. Machine wash warm inside out and tumble dry medium. See size chart for a better fit.